In this short story from Baba, we learn about the terrible folly of our human nature which so easily turns away from the nurturing Divine Hand. So often, we forget the acts of His Grace which have saved us from the consequences of our own actions - and return once again to our old habits. It is a wonder that the Lord has so much patience! 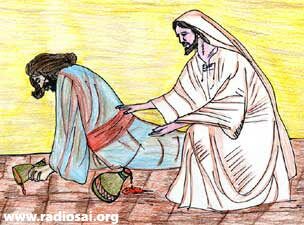 In this story, Baba has portrayed real life and hitherto unknown examples from Jesus’ life to educate us in self-awareness; let us use this Chinna Katha to examine our own faults and resolve not to squander the Grace that Baba continually pours upon us! Once Jesus was walking along the streets of a city. It was a slum area. He saw a young man rolling in dirt, dead drunk. He went to him, sat by his side and woke him up. "Son! Why are you wasting your precious youth in drinking?" The young man replied: "Master! I was a leper. You cured me of my leprosy. What else can I do?" Jesus heaved a sigh and walked away. In another street he saw a man madly pursuing a beautiful woman. Jesus caught hold of him and asked him: "Son! Why do you desecrate your body by indulging in such a sinful act?" The man replied: "Master! I was really blind. You gave me vision. What else can I do?" Jesus trudged along another street. He saw an old man crying bitterly. 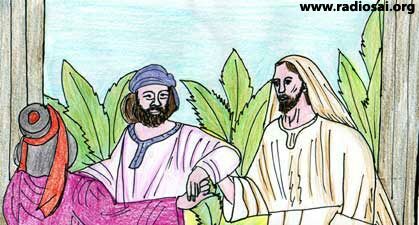 Jesus approached him and gently touched him. 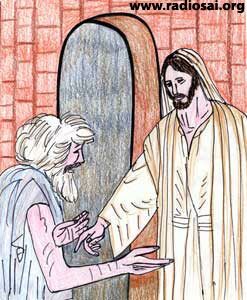 The old man wiped his tears and looked at Jesus. Jesus questioned him: "Why are you weeping old man?" The old man said: "Master! I was nearly dead. You granted me life. What else can I do except weep in this old age?" In times of difficulty and distress, we cry out for God's help. But when God, out of His boundless love and compassion, responds to our prayer, we ignore Him and fall back into our self-centered life. One must guard oneself against this greatest sin of ingratitude towards God.